On Interstate 80 at the Yolo Causeway between Davis and Sacramento, you will see signs identifying the Vic Fazio Yolo Wildlife Area. This 25-square-mile wildlife preserve, much of which is flooded in winter, serves many functions. Wetland conservation and education are the focus of the Yolo Bypass Foundation, which gives regular tours and so far has restored more than 3,700 acres to wetlands that attract migrating birds. The area is managed by California Department of Fish & Wildlife, and parts of it are open to bird hunting. The north side of the preserve, between Interstate 80 and the railroad tracks down which Amtrak trains whiz every couple of hours, is open to dogs and their people (see map; look for dog symbol between highway and railroad tracks). For bird-dog folks, it offers off-leash open space in which to train (but not hunt), along with ponds where dogs can cool off or practice retrieving. You'll often see Labs and setters going through their paces. But you don't have to be a hunter or trainer to enjoy a stroll down the dirt road that runs down the middle of the miles-long, quarter-mile-wide strip of land. It's open to all and is at its best during dry spells in winter and spring, when fox-tails and thistles don't pose hazards. Make sure your dog has an excellent recall, as swampy places, burrs and stickers abound. This is wild land, after all, not a dog park. The downside here is highway noise, but the Interstate itself is elevated for most of the length of the causeway and well fenced in sections that are bermed, rather than elevated. Most of the train track is also on trestles well above ground level, but some sections are not, so keep a close eye on your companion. To get there: From Sacramento, take Interstate 80 west. The exit for the wildlife preserve is the first one at the end of the causeway. Curve right onto Road 32A and take the spur to the left leading up the levee. Park by the silver railing or the yellow gate. The dirt road into the preserve starts at the bottom of the levee; you'll see it once you crest the rise. A recently posted sign identifies the preserve (but says nothing about dogs). From Davis, exit at the Vic Fazio Wildlife Preserve sign on the west end of the causeway and go left on Road 32B. Follow it under the highway (where it becomes 32A) and up the levee to the parking area. Note: A self-driving tour route on the south side of the Interstate offers interesting perspectives for bird-watching, but your dog will have to stay in the car. Follow the signs under the highway and into the preserve. 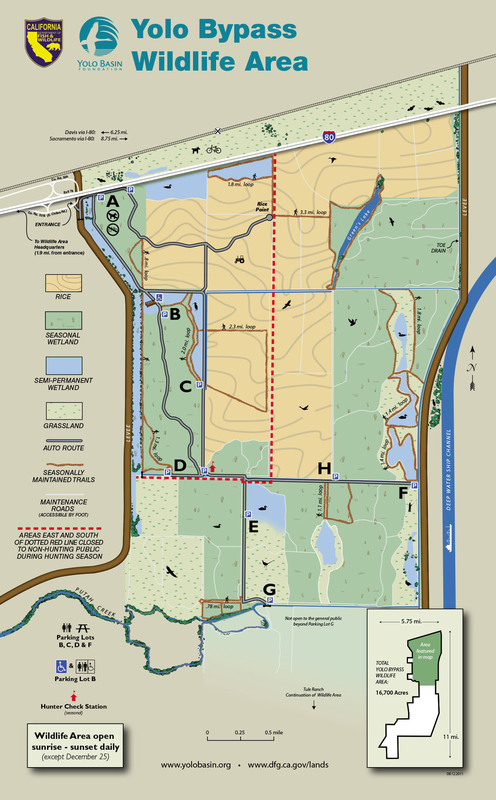 Check at the information kiosk for maps and current regulations regarding wildlife viewing, dog training and hunting. Please note that in some years (but not this one, so far), portions of the dog-training area are leased for cattle grazing and the public is prohibited from entering.